Advocate staff photo by MATTHEW HINTON--New Orleans Saints safety Alden Darby (42) runs a drill at the Saints training facility during minicamp in Metairie, La. Wednesday, June 15, 2016. 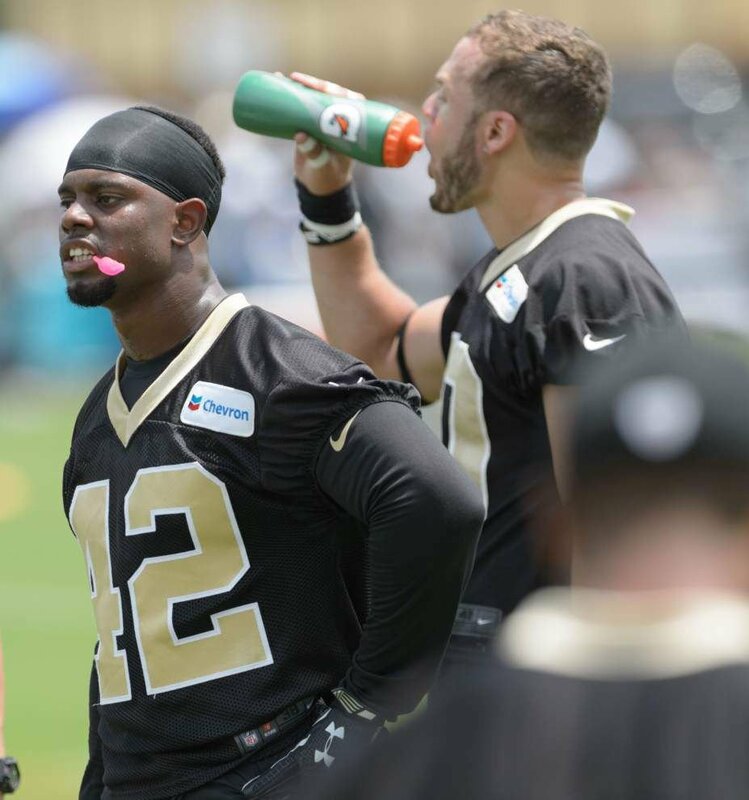 Advocate staff photo by MATTHEW HINTON--New Orleans Saints safety Alden Darby (42) cools off with New Orleans Saints defensive back Erik Harris (30) at the Saints training facility during minicamp in Metairie, La. Wednesday, June 15, 2016. An NFL locker room often is a collection of close-knit position groups, drawn together by all the time each group spends in the meeting room and their shared skills, all tied a little more loosely together in the context of the team at large. Given the ever-changing nature of NFL rosters, the biggest personalities often belong to long-tenured veterans who have built deep friendships together over time. Alden Darby transcends position, playing time or longevity. Darby, a little-known safety who joined the practice squad in September, has become one of the team’s most popular players — a smiling, laughing bundle of boundless energy who might be doing cartwheels on the field between drills, be right in the middle of a heated debate about the NBA or be needling his teammates at the pingpong table that now occupies one side of the locker room. Darby’s oversized personality is something of a rarity for a player who hasn’t taken an NFL snap. But that’s how he has always been. Darby, who went undrafted out of Arizona State, spent 2014 training camp with San Diego and 2015 camp with Pittsburgh before latching on with New Orleans last season, only has one setting. Full-bore, consistent enthusiasm always ends up earning him a place in the locker room. What Darby’s teammates always come to appreciate is that his personality springs from a place of genuine joy. A lot of players in Darby’s position, undrafted and cut twice already, would get a little worn down by the disappointment and uncertainty of chasing the NFL dream without the prize of playing in a game. Darby still sees the NFL world with wide-eyed wonder. Darby’s enthusiasm adds another jolt of electricity to a Saints secondary that already is the liveliest corner of the locker room. Every team needs players with that kind of enthusiasm. Finding somebody who doesn’t need to manufacture it is no easy task. Darby once again faces a difficult battle to make the 53-man roster. 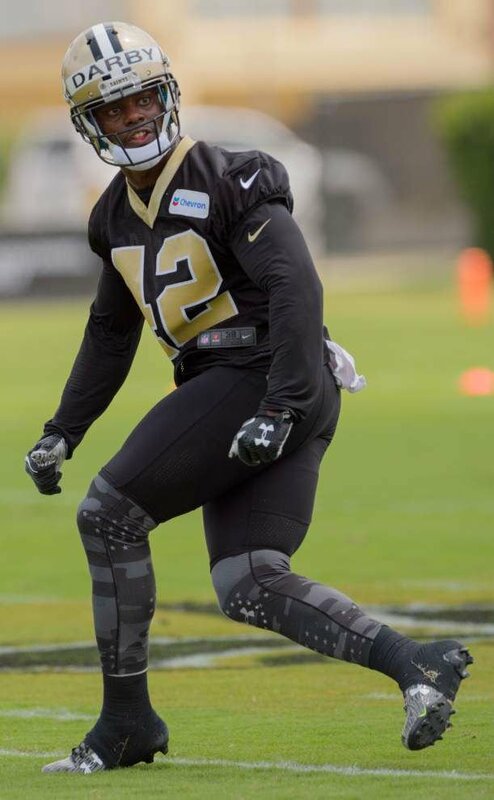 New Orleans already has Kenny Vaccaro and Jairus Byrd entrenched as starters; second-round pick Vonn Bell will have a role; CFL import Erik Harris has been much better than advertised; and the re-signing of Roman Harper suddenly makes safety one of the deepest positions on the defense. No matter. Darby has attacked the offseason, partnering with Vaccaro to learn how to better prepare himself to battle for a roster spot. Vaccaro is far from the only Saint who’d love to have Darby lighting up the locker room this season.